Listed below are various Ford Camper Van Resources including both custom Ford Class B RV Makers along with informative sites. If you would like to have your site listed below; please Contact us. Sportsmobile is a custom Campervan manufacturer that makes Class B motorhomes from all types of vans including the Ford Econline and now Transit vans. 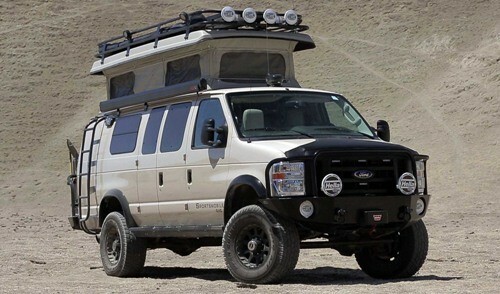 They are well known for their completely custom and unique Ford 4X4 Sporstmobile Camper as shown above. Colorado Camper Van is a company based in Drake Colorado that builds custom pop up van roofs for camping and utility applications along with performs 4×4 conversions. Camper Van Fun is an informative resource site that contains a wealth of various pieces of information bout Campers, Class B Motorhomes, Trailers and more. Click on the link above to go directly to the Ford Camper Van page. If you like this site and are interested in other types of camper vans particularly for Volkswagen; you may want to check out another one of the sites in our network. These include camper van classifieds for VW Transporter vans; from the Microbus to Vanagon and most recent Eurovan.